Justin | Uncategorized | 01 1st, 2016| Comments Off on Ring in the New (Issues)! Justin | Uncategorized | 10 19th, 2015| Comments Off on Surveys Sent, Supporters! We haven’t submitted to Comixology yet, so I decided to look into their policy on distribution (don’t want to create any tangles). Fortunately, we don’t have to sign any exclusive deal with them if they pick us up, so I think we need to start sending out the digital issues to you folks! We’ll be sending out a survey so we can get everyone’s current email addresses and then we’ll begin by sending you the relettered issue one and then go from there. The books will be in a PDF format, so let us know if there’s another format you’d like them in. In other news, Dan has been getting help with color flats from our friend, Angel. She’s got a Facebook page dedicated to her artistic pursuits, so check out the link below to see some of her stuff. She is available for commissions, so be sure to hit her up if you need anything! Keep an eye on your email inboxes for the survey (whichever one you have your Kickstarter account tied to), so we can start getting the story to you! Someone I know just posted the following image. Below that, you’ll find my response to it. 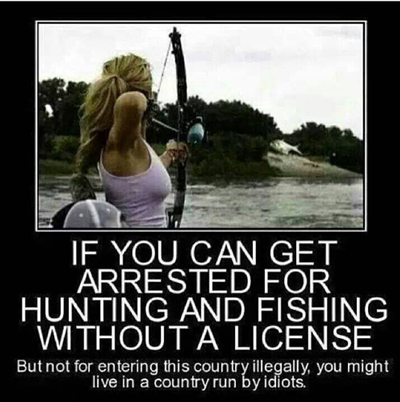 To be fair, yes, you can be arrested for entering this country illegally (see this link for some numbers). Also, 99.9% of the time, people poaching the wildlife that belongs to all of us citizens usually get a fine, since it’s a misdemeanor, not arrested.